Never let it be said that the Nintendo Download lacks variety. On the same day that Nintendo launches new water-based puzzle game Fluidity, Korner Entertainment conquers completely the opposite end of the scale with virtual fireplace simulator Fireplacing. DSiWare is equally varied, with portable music studio Rytmik: Rock Edition rubbing shoulders with Oriental tower defence game Dairojo! Samurai Defenders. Virtual Console even gets a double whammy, with a classic 8-way shooter landing alongside a side-scrolling platform shooter about a legendary Monkey King. There's a little something for everyone today. 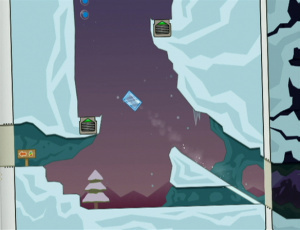 Fluidity (Nintendo, 1200pts) – Known as Hydroventure in Europe, this is a new physics-based puzzle platformer from Nintendo that sees you take control of a mass of water, able to change states into ice and steam in order to traverse the tricky stages. Our review will be available later this week. Fireplacing (Korner Entertainment, 500pts) – Light the pinecone, coax the glowing embers into flames and watch as the majestic testament to your incendiary skill burns ever hotter and hotter. Yes, it's a fireplace simulator; we'll put it through its paces and bring you a full review shortly. 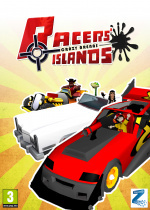 Racers' Islands: Crazy Arenas (Zallag, 600pts) – A battle-themed off-shoot of Racers' Island: Crazy Racers, we weren't all that keen on either title, as our Racers' Islands: Crazy Arenas review explains. Fluidity – If you're not sure whether to drop 1,200 Points on Nintendo's latest puzzler, this free demo is just what you're after. Wolf of the Battlefield: COMMANDO (Arcade, 800pts) – Pinch yourself and take deep breaths: you're not dreaming, this is in fact the return of Virtual Console Arcade to the Nintendo Download. An old-school top-down military shooter, this is classic Capcom arcade action of the era. We'll march our review out later this week. SonSon (Arcade, 800pts) – No, you're still not dreaming: that's two Virtual Console games on the same day. 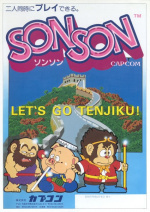 A combination of 2D platformer and side-scrolling shooter, SonSon is based on the classic tale of the Monkey King. The nature of our upcoming review will be irrepressible. Rytmik: Rock Edition (Cinemax, 200pts) – An absolute steal at just 200 Points – its original European release cost 800 Points – Rytmik: Rock Edition is the guitar-driven cousin to synth dance studio Rytmik, and a tool any aspiring rock star should pick up. Our Rytmik: Rock Edition review tells you why this one hits the high notes. Dairojo! Samurai Defenders (Abylight, 800pts) – A tower defence title with shades of the Far East, this comes with a multiplayer Download Play option for local players to face off against each other. We'll rally the troops and bring you a review soon. Space Ace (Digital Leisure Inc, 800pts) – Remember Dragon's Lair? Space Ace is a spiritual successor set in space, so if you've played Dirk the Daring's adventures you should have a fairly good idea of what to expect. Our own space ace will have a review available later this week. Woohoo, two VC games! And finally Capcom enters the VC ring in the West. Good god two VC games!? Have we all gone mad? This and Fluidity makes for a very surprising update. Not bad for a change. 800 points is too expensive for SonSon though. Its not worth any more than 500 points. I almost drop my Cup of tea, and my Top Hat! Ditto Jump. I"m probably get Rytmik and if the demo for Fluidity is good I'll grab it. So capcom finally made it, huh? How 'bout 1942 while they're at it? I love how Rytmik: Rock Edition says "for the best musical experience, listen using headphones or a quality speaker system (not included)". I want a free quality speaker system with my download, and I want it now. Finally, Capcom. I'll be getting Commando for sure. I really want Black Tiger, though. Fireplacing? Is that even a verb? To place fire, maybe? I normally have to ignite a fire, I lack the ability to pick fire up and place it elsewhere. I guess I'm just not gifted like that. I don't see it getting a burning recommendation, if it doesn't spark the reviewer's interest then it's just gonna get flamed. But seriously, it lacks the main function of a fireplace - keeping you warm. And it fails to do what it advertises (going on the screenshots) - it doesn't look at all realistic. "The nature of our upcoming review will be irrepressible" - genius! SonSon and Commando. Dear Americans, I'm very happy for you. Glad we finally got some VC games. I already know I don't like Son Son, and I tried out Commando and didn't like it either, unfortunately, but that was on the iPod Touch. Anyone know if the VCA version controls better? EDIT: Looking at the video, no, no it does not. Oh well. More download and play love makes up for it though. Can't wait for the review. I keep looking for an vc arcade game that that you cant already get in a compilation....cheaper. It would be cool to have an excuse to get a vc arcade game some day. I love that more free demos are going up on the Shop Channel. I'll definitely be testing Fluidity out this evening when I get home from work. Nice week! I'm definitely getting Fluidity. I'll get the demo too but I'm very confident in this one. Also, 2 VC games!? That's awesome even though I have zero interest in either. As long as Mario Party 2 is out by the end of the year, I'll be happy. Thanks Nintendo! Double Virtual Console release? Yes please! Solid titles, too. @Mickeymac: The VCA version just has to control better than on iPod Touch... I have no evidence of this except the fact that one uses buttons and the other does not. 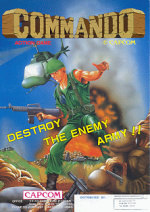 I loved Commando growing up.. But I think I'm holding out for Gun.Smoke. Make it happen, Capcom! DOUBLE!!! MAXIMUM!!! VC!!! AWESOME UPDATE!!! I'll have to read the review & try out the demo to tell if Fluidity is right for me. Personally, I'm appalled by the graphics. A great week for me. SonSon is one of my favorite arcade games, Commando is good also, and Space Ace is an insta-buy for this Dragon's Lair fanatic. @Crunc: Not the first time it has happened. When Pokemon Rumble came out it had a demo along with it. Although, since this is only the second case of this happening, I'd say Nintendo needs to pick up the frequency of demos on the same day as release. Double VC? ICE to see you again! Tried the demo and Fluidity seems like a very cool game...but it's not my thing. It's like LocoRoco, but more frustrating, and I didn't care much for LocoRoco either. Want to see more from Fluidity. Glad it gets a demo. Not just 2 games, but 2 arcade games! I think hell just froze over. Nothing I'd buy, but having two VC games released in one week is pretty cool. 2 VC arcade games in one week? Awesome! Here's hoping we have consecutive VC releases until the end of the month. Will be checking out the Fludity demo too. 2 VCs in a week! Groovy! @17 What about Space Harrier? I'll be picking up the 200 point Rytmic, of course. Thanks Cinemax. No one is complaining this week? Why Nintendo? You took away the best part of Nintendo Life's comment section! Anyway, Fluidity looks really cool. Commando is good to get, even if you already have Capcom Classics Collection. The VC version offers you the option of stretching the screen to fit your TV. CCC version didn't (something that seriously annoyed me with some of the games on the two CCC that came out on PS2). Finding this out, I'm looking forward to more Capcom VCA releases now! I wish Konami would get involved with VCA (even show a sign they still support the VC and Wii in general). Would like to play the likes of Gyruss, Contra and Super Contra (arcade versions) stretched out to fit my TV. Then again, Contra NES isn't even on VC yet, so not holding my breath. Anyone playing Commando getting an itch for the classic Ikari Warriors arcade game? Played about half the Fluidity demo, I like it better so far than Terrover. I'm a big fan of simple cartoony graphics like Max and the Magic Marker so this looks got to me. And I know it's a book, but I could do without the desktop backdrop, why can't it just zoom into the page after the book motif has been established? Not sure I'll buy it as I have 1000 points sitting there ready to go for weeks, maybe if Mario Party ever comes out and it's 800 I'll get both. I forgot we got the Pokemon demo the same day as the boys played the demo for about 3 weeks before buying the game w/ a Nintendo Points card Xmas gift. And then they almost never played the game as they had had enough. The world needs another Space Ace port. These 2 games are already on the capcom collections for much cheaper. Meh, nothing for me. Still need to DL those demos and finish Cave Story. Some stats here: Looked it up at wikipedia's VC release list, and this is the first time since December 21st of last year that VC had two releases in a day (Ninja Gaiden VCA and Super Smash Bros.). First time for more than one VCA release in one day since it's introduction March 25th, 2009, when 4 were released (Gaplus, Mappy, Star Force, The Tower of Druaga). I really hope such dry spells as pretty much all of 2010 end in 2011 with the VC's debut on 3DS! If we're lucky, the popularity of it will spill over onto Wii's VC. At any rate, nobody can say Virtual Console is dead when Nintendo is bringing it with their new baby! Some really good stuff this week. Fluidity is awesome! It's great to see two VC games in an update for a change. I honestly can't remember the last time that happened. Oh and for those of you out there that actually enjoy shovelware, Nintendo has you covered with Fireplacing and Racers' Islands: Crazy Arenas. Anyway, looking good this week! Sweet! Looks like I was right about us entering the annual holiday VC rush. Enjoy retro lovers! Wow. I am absolutely stunned. And it's true, Rytmik sounds BEAUTIFUL through stereo earphones. Sweet 2 vc games! This is the 3rd best week! is that a heartbeat for the Virtual Console? I hope so! It's about time we get some more VC games. Okay, so when do we get Yoshi's Island SNES? Awesome update! Plus a Fluidity Demo! NICE! Will be picking up Rytmik Rock and possibly Fluidity after I try the demo. @Bulbasaurus Rex: Sorry, Space Harrier is on Sonic's Ultimate Genesis Collection. @Token Girl: You're not the only one to realize and predict thus. It's sad we only get decent releases one month out of the full year, but I suppose it's (barely) better than nothing. It's nice to see some love for the VC Arcade, but when will we get Namcot's arcade offerings -Solvalu (sp?) and StarBlade? Japan has had them for ages. Great start for December with Fluidity, but Nintendo, XGen, Nicalis; Machinarium, and NightSky this month pretty please!!! Seriously! The fluidity demo is great. Haven't bought a game off the Wii Shop Channel in ages, so Fluidity for me. I really enjoyed the Fluidity demo, but I am balking a bit at the full game price. $12? Still, I may get it. It's a great use of motion controls too - perfect control scheme for this game.